It’s time for another blog from our wine expert, Neil Hodgson, this week he’s talking rosé wines, pop down to Fresh Choice Nelson for yours! Rosé wines are currently the fastest growing range in supermarket wine sales, and I’m not surprised. Not so many years ago they were seen as just simple, easy drinking wines, but all that has changed, they are now seen as a serious wine style. While the easy drinking style of Pinot Noir Rosé that is bursting with strawberries and cream flavours is very enticing, it is the drier style that has so much to offer when it comes to complexity, layers of flavour and enjoyability with food. Because rosé wines are generally made from the juice of red grapes that has only had a small amount of time in contact with the grape skins after being crushed, the key is to think of them as lightly coloured red wines rather than pink wines.Thinking like this moves them from an enjoyable drink to a great wine style. 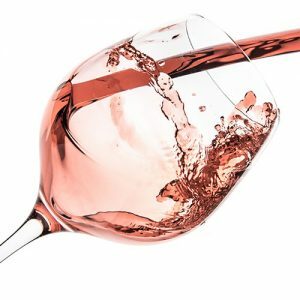 When made well rosé wines can appear sweet but are actually off-dry. They are just bursting with delicious ripe fruit flavours and are a beautiful thing, wines like the Rockburn Stole Kiss Rosé ($27.99) from Central Otago fit into this category and it is deservedly attaining cult status, it is a rosé that is both pretty in colour and seious in flavour. The Tohu Rosé ($14.99) from Marlborough and the Kahurangi Estates Rosé ($17.99) slot into the slightly drier category but with beautiful ripe fruit flavours, and are both simply delicious drinks. One of my favourite styles is a rosé sparkling wine, and one of your favourites at Fresh Choice Nelson is the Cloudy Bay Sparkling Rosé ($36.99), it has creamy bubbles that dissolve in your mouth, lovely fruit flavours and some nice fresh acidity in the finish; it is the perfect celebration wine and is incredibly popular as a wedding wine. This summer add rosé wines to your shopping trolley, you might be surprised just how much you love them! This week at Fresh Choice Nelson, we’re welcoming back Paula Saengthian-Ngam as our guest blogger (Find Paula on Facebook). Paula’s been busy developing recipes for new season Inspire Meal Bags. These take the guess work out of what to have for dinner… Every bag contains only the freshest ingredients, comes with a recipe card, and a recommended wine match. You’ll be Inspired! I have just finished developing some new season Inspire Meal Bags. Look out for them at Fresh Choice Nelson soon. I have a couple of favourites in this new release… The Crispy Crumbed Tofu with Chilli Jam, accompanied by a really fresh carrot salad with lime and coriander. It’s a deliciously light summer meal with fabulous flavours. The Sweet & Sour Pork Meal Bags are sure to be a hit with kids. My children really enjoy this one. It comes with quinoa and rice blend instead of plain white rice. As with a lot of the meal bags there may be some ingredients left over. And a grea idea with this bag is to cook all of the quinoa and rice blend and use what you don’t eat with the Sweet & Sour Pork as a base for this energy rich salad. 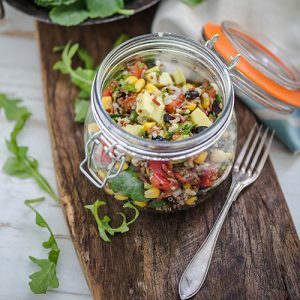 It’s handy to take to work for lunch, pop it into a jar and it’s ready to serve! Or have it for dinner the next night with some barbecued chicken. Mix everything together and serve! You can eat this salad on its own or for added protein eat it with salmon or chicken. Serve it with some delicious Rodrigo’s Sourdough bread, (also available from Fresh Choice Nelson). Bacon without a doubt, one of my favourite ingredients… Even as far as bacon and egg ice cream! I used to make my own lamb version at Mint Dining Room; but today is all about pork. There’s more to this delicious ingredient than sliced; hocks, chops, gammon steaks, bacon mince, speck, lardons, the list goes on… But here’s my quick guide to the sliced stuff! Middle bacon is cut from the loin. It has a portion of loin, with some streaky from the belly coming off it. Excellent for frying, also for cooking where it might will be kept whole. It’s the best option for cold sandwiches and salads as it only has fat around the outside and can be trimmed so you don’t get that greasy taste. Shoulder bacon is cut from the leg. It can be tough, but it has good flavour and is cheaper than the middle variety. Excellent for cooking in dishes where chopping is required. The rind on this cut can be quite thick. Streaky is cured pork belly. When choosing your streaky, it is important to check the fat content. Although my favourite choice for breakfast, it can be fatty. 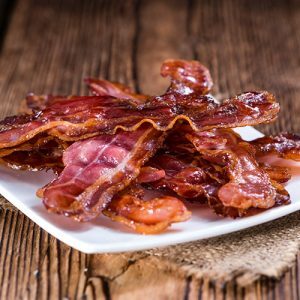 Most of the fat should cook out, but if it’s too fatty the bacon can disintegrate or not fully render. This is the one to go for if you want something crispy! There are two main ways bacon is cured; dry cure, and brine. Brining is faster and cheaper but tends to leave moisture in the cuts, and some cheaper brands can become waterlogged. Dry cure is my preference. The basis for both is sugar, salt and spices. Brined includes the addition of water and immersion until cured. Dry cured is rubbed with sry sugar, salt and spices. Farming methods are something else to consider. Free Farmed or Free Range are, of course, the more ethical choice. Pestell’s Rai Valley make a dry cured bacon in Stoke (Nelson). Their pork is free farmed, and the product is used by a lot of local eateries. Being dry cured there is no water loss during cooking so it crisps up very well. I recommend their streaky (with two poached eggs, and some grilled ciabatta). Hop down to Fresh Choice Nelson for your weekend brunch! The World of Wearable Art, born in Nelson, but delivered in Wellington. A creative arts show where artists imaginations go wild and push the boundaries of what they can wear. 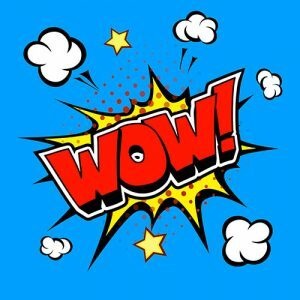 However, WoW is not the only wow in Welly… Garage Project, craft beer producers extraordinaire, have been creating weird but wonderful beers in our capial city since 2011. GP are the most innovative craft beer brewers we know. They have the ability to consistently make beers with weird ingredients like lemongrass and ants (yes, ants!) taste fantastic. In six short years of brewing these prolific brewers have pumped out over 140 different brews, each with their own uniqueness. Bold in flavour and with delightfully weird graphics on the can! Underpinning GP’s inventive success is their core range of go-to beers! Hapi Daze 4.6% Pale Ale – Has the aroma of NZ: earthy, woody forest. This is an all-occasion, down to earth brew with a solid amount of hops that doesn’t overpower the toffee malts. An emphatically flavoured sessionableale. Garagista 5.8% IPA – With a the first psst of the can you know you’re in for a hopmungus treat. Huge hop aroma and straight out hop flavours of tropical fruits, passionfruit and pine flavours. No malts here folks, just pure hopulence. Pils n Thrills 5.5% Pilsner – Grainy malts up front, a soft tropical middle then a citrus bite which leaves a lingering crisp, clean bitterness at the end. A fitting theme for the Wellington Spills n Thrills Roller Derby Bonanza hosted by Garage Project and Richter City Roller Derby last weekend. Cereal Milk Stout – A new spin on and old favourite only this time with a Nitro Pour. Shake the can then immediately dump it upside down in a glass and wait for the nitro to work its magic… Then, WOW, the smoothest, creamiest breakfast you’ll ever have! Hopefully this new brew will arrive on the Fresh Choice shelves real soon! Thanks to our Guest Blogger and beer aficionado… Denis “the man” Cooper! It’s time to welcome back our Guest Blogger, Maddy Bellcroft. This week Maddy talks about bulk bin buying; and there’s a bonus recipe! – Find Maddy on Facebook. It’s time for part two in my series covering the organic bulk bins at Fresh Choice Nelson. This week I’m bringing you a savoury spring salad that’s sure to put a smile on your face. The veggies can be substituted for whatever you have available in your fridge, or choose what’s in season. The first seven ingredients can be found either in the organic bulk bins or in the small pre-made packages of organic bulk foods. The rest of the items can almost all be found in the organic versions as well. 1/2 C of your favourite dressing. Urban Hippie Miso or balsamic vinaigrette work well. Preheat oven to 180 degrees C. In a small pot place quinoa and millet along with two cups of water, bring to a simmer and cook for 15 minutes, the cover, remove from the heat and set aside for 20 minutes. Soak sundried tomatoes in boiling water for 1/2 hour, then drain and slice. In a mixing bowl add oil, curry powder, chilli, salt and sesame seeds. Mix well, then add diced eggplant and cauliflower. Coat them with sauce then place on a baking paper lined tray. Roast in the oven for thirty minutes until veggies are soft. 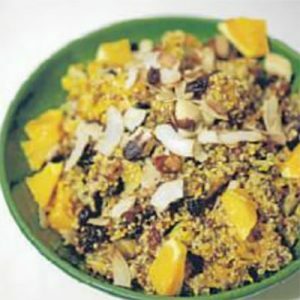 In a large bowl mix together cooked quinoa mixture, roasted veggies, raisins, Brazil nuts, coconut chips, orange and dressing. Mix well adding extra dressing and salt to taste. Serve with Rodrigo’s Sourdough bread.